Iared Diamond acroasim Londinii Februario 2013 habet. Iared Mason Diamond (natus Bostoniae 10 Septembris 1937) est physiologus, oecologus, geographus, biologus, anthropologus, et auctor Americanus qui quattuor libris scientiae popularis innotuit: The Third Chimpanzee (1991); Guns, Germs, and Steel (1997, Praemium Pulitzer); Collapse: How Societies Choose to Fail or Succeed (2005); et The World Until Yesterday (2012). Diamond, primum in physiologia educatus, varias scientiae provincias conectere solet, inter quas anthropologia, oecologia, geographia, et biologia evolutionaria. Professor geographiae in Universitate Californiensi Angelopoli docet. ↑ "Jim Al-Khalili talks to Jared Diamond about his journey from the gall bladder to global history via a passion for the birds of Papua New Guinea." Vicimedia Communia plura habent quae ad Iared Diamond spectant. Vicicitatio habet citationes quae ad Iared Diamond spectant. Pagina Diamondiana in ordine geographiae Universitatis Californiensis Angelopoli. 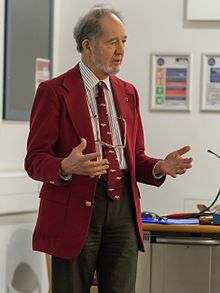 "UCLA Spotlight – Jared Diamond." 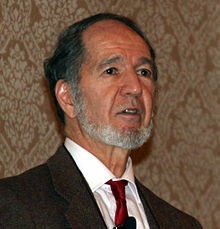 Jared Diamond: Why do societies collapse? (TED2003). Jared Diamond: How societies can grow old better (TED2013). Collapse: How Societies Choose to Fail or Succeed. Acroasis, The Earth Institute in Universitate Columbiae, Aprile 2007. De Guns, Germs and Steel. PBS. Novissima mutatio die 1 Octobris 2018 hora 01:33 facta.